What do World of Warcraft and Henry David Thoreau have in common? 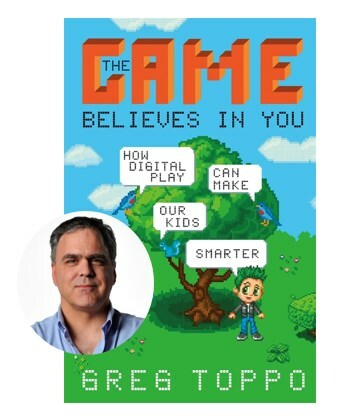 In his new book The Game Believes in You: How Digital Play Can Make Our Kids Smarter, Greg Toppo, a K-12 education journalist for USA TODAY, explores the educational gaming movement. Toppo highlights different types of gaming used in the classroom, including a video game simulation of Thoreau’s Walden and a World of Warcraft humanities curriculum. While skeptics might think this is just another book about the “next big thing” in education, Toppo makes an effective argument for why games are a powerful tool that help students learn while keeping them engaged. He explains the cognitive science behind gaming and dives into less commonly explored ideas, like how gaming might benefit students with ADHD. I recently chatted with Toppo to learn about his book and hear his take on the potential of gaming. Let’s start with the basics: How do you define educational gaming? And what distinguishes an educational game from instructional software? I would define educational gaming as using game principles to teach pre-determined content. Students have direct access to the material and can learn the material at their own pace. A good game can teach content really well so that it’s “sticky.” Something else that’s key is that games give you the ability to fail and try again right away without any judgment or audit of your worth as a person. I would maintain that a good game doesn’t rely on bells and whistles. It relies on getting you into the material, keeping you in the material, and giving you satisfaction when you get through it. Whether it’s a game or not, it doesn’t matter. If it’s instructional software—and not a game—and it’s keeping the user on the edge of their ability, then great. I just haven’t seen a lot of examples of that working well. What role can gaming play within classrooms? Can teachers use games to supplement, or even improve upon, their existing curriculum? I want to be crystal clear that we’re not talking about replacing teachers with machines. This is about helping teachers refine what they’re good at and giving them more of an opportunity to do that. At their best, games should provide students with instant feedback on how well they’re doing. This is a big shift from annual standardized assessments, which show students whether they’re mastering content at a specific point in time. What does this mean for students and teachers? It can’t help but be positive. If we’re stopping the learning to assess [what you’re] learning in 2015, then we’re doing it wrong. Technology has streamlined so much in our lives; it’s amazing to me it hasn’t made assessments invisible or built into the instruction. If assessment is built in, there’s more time for instruction—it makes teachers happier. Let’s talk impact. Can gaming play a role in closing performance gaps or reaching students who are less engaged? That’s one of the most promising aspects of this. A good game invites even reluctant learners into the instructional material in a way that nothing else does. A kid who’s failed in school for five or ten years has gotten a bit cynical, and I would say that a really good game can kind of cure that cynicism. I make the comparison somewhere in my book that when things go wrong in schools, schools look at what’s going wrong in a kid’s life as an explanation. Are they sleep-deprived or hungry, or are their parents absent? The observation I make is that for game designers, those conditions are almost a given[…]but you’ve got to create an experience they can be successful at anyway. How does the digital divide affect gaming within K-12 education? Did you see any gaps in schools’ access to gaming? Educational games are not gold-plated tools, and a lot of this stuff is actually free. iCivics games, for instance, are free. Some games are also consciously low-tech because they don’t want the digital divide to get in the way. Many of the games I saw were ones you could play on a very old desktop computer. What would it take to scale the use of educational gaming? What are the barriers facing teachers, schools, and districts right now? First, parents and teachers need a better way to separate the wheat from the chaff because there are a lot of terrible educational games out there. And we’re getting there. There’s much more sophistication and people are starting to be able to tell the difference between good and bad games. The other thing is that if more people understood the very basic idea of “hard fun,” we’d be in a much better place. I start my book off talking about this. If more people understood that hard things can be fun and that school doesn’t have to be complete drudgery, that would help educational gaming scale more quickly than anything. Take away the word “game,” and substitute it with whatever noun you like, and think about what our reaction would be if we knew our young people were preoccupied with doing something really hard. Are changing academic standards a barrier for teachers making decisions on adopting games? Or are they potentially a challenge for game designers? One thing I don’t talk about in my book is about how much game designers like the Common Core, which is now a reality in so many places. From their point of view, they can now design a game in math or ELA that millions of teachers can use with much more confidence. In that sense, Common Core has been really good for the gaming movement. You spend one chapter exploring the lack of compelling evidence linking violent games to violent behaviors among kids and adolescents. What other misconceptions around gaming are you hoping to clear up with your book? Moving forward, should Ahead of the Heard readers be optimistic about educational gaming? Why? The quality of educational gaming is improving rapidly, and better games are appearing all the time. There are sites like Graphite that act as a clearinghouse of good games versus bad ones. Another helpful sign for me is that this type of technology is already in everyone’s hands. How many of us have an overhead projector? Not many. But how many of us have a smartphone or laptop? Smartphones and iPads have turned everyone into a gamer. So we understand this experience of “hard fun” and the power of being able to try again immediately in a way I don’t think we did even five years ago. This entry was posted in Education Innovation, Education Technology and tagged edtech, educational gaming, gaming, Greg Toppo, scaling innovation on May 20, 2015 by Carolyn Chuong.